A gorgeous bride, dressed in a fabulous wedding attire, steps out of the car followed by her bridesmaids. All invitees anxiously wait to get the glimpse of the beautiful bride. On seeing her in the best avatar, they start admiring the beauty. Well folks, this is what normally happens in a wedding. But in a recent wedding ceremony I attended, nothing of this kind took place. All the guests were busy glaring at a centerpiece. 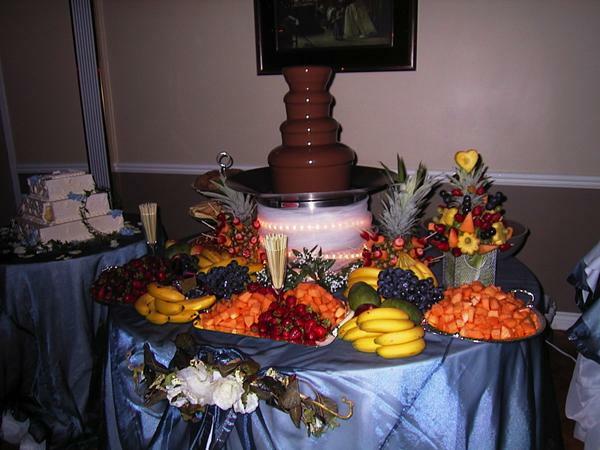 The centerpiece was a richly designed multi-tier chocolate fountain. Trust me friends, guests had water in their mouths as the fountain poured luscious chocolate. All were eager to dips into the delicious chocolate. I am sure you are also planning to install a chocolate fountain for your next celebratory event. Yes, that’s a great idea. But before shaking hands with the vendor consider the following things for an awesome chocolaty experience. Before finalizing the idea of a chocolate fountain, analyze the package offered by different vendors. To start with, hire an established service provider. They offer packages that include the amount of chocolate, number of dips and the number of guests. There are many fountain providers who only offer basic strawberry and marshmallow dips. They charge extra for any special dipping items. So, ensure that you get variety of dips in a single package. Also, prefer a package that provides unlimited amounts of dips and chocolate. Imagine multicolored chocolate cascading from the fountain. Blue, yellow, pink and orange dyed chocolate inviting guests for dips. Yes, this is possible. There are myriad of flavor and color options available. You can ask the service provider to light up your celebrations with different flavors. You can select from the traditional milk, white and dark chocolates to some of the elite hazelnut, mint and strawberry chocolates. In case you order in advance, you can get expensive chocolates like Godiva, Belgian Couverture and Ghirardelli also. The bigger the fountain, the better it looks and the more compelling is the scene it creates. There are different sized fountains available for every budget. Normally, a vendor would provide chocolate fountain with four tiers. You can ask for additional levels, but it will be charged extra. The most appealing fountain is the largest 44” one, but it is pretty costly and may not accommodate your budget if you are looking for low-priced luxury. Unless a fountain works swiftly, it won’t create the effect that you have invested for. The quality of the chocolate matters. When selecting the package, ensure that the chocolate used should have high percentage of cocoa butter (ideally 32 to 39 percent). Some of the vendors may offer low quality chocolates and add significant amounts of oil to get a consistent flow. However, that is not what you want. Select chocolates like Godiva, Ghirardelli, Belgian Couverture, etc. for an unending splash of chocolate and delightful dips. Chocolate Fountains are a fun thing that create a gripping effect. However, while fulfilling your desire, consider doing an initial inspection about the aforementioned fundamental things. A quick question and answer session with the vendor will save you from any unexpected glitch or embarrassment during the event. Also, chocolate fountains are only meant for indoor events. Don’t be too ambitious. Don’t try to setup the fountain in the outdoors – it can be done, but there are risks. Hire festiveice services from a provider who offers a dedicated staff for ensuring the smooth functioning of the fountain.